2Department of Medicine and Surgery, Universidad Nacional Autónoma de Honduras, Honduras. Citation: Vidaur NA, Alvarenga O, Vidaur EA, et al. Solitary Pulmonary Nodule, Pulmonary Actinomycosis of Chronic Evolution: A Case Report. Electronic J Biol, 13:3. Background: Actinomycosis is a disease caused by bacteria of the genus Actinomyces. This pathology has different forms of presentation where the thoracic affectation represents 15% of the cases. Clinical case: A 22 year old male patient from the Department of Cortés, Honduras, who was admitted to the clinic with a pneumonic process in 2012, performed a chest tomography with lung lobe lesion, received antibiotic treatment, and transiently improved his Symptomatology being discharged. Due to the persistence of the patient's symptoms in 2015, he referred to the Cardiopulmonary Institute from which the chest x-ray and tomography were performed, which reported right apical mass with characteristics suggestive of neoplastic lesion; Bacteriological studies were negative; bronchoscopy evidenced endobronchial tumor of the right upper lobe. Subsequently, thoracotomy and partial decortication of the lesion were performed. Biopsy reported: lung tissue with altered architecture, fibrotic stroma with separate granules of bacteria compatible with actinomycosis. The treatment with crystalline penicillin was modified showing improvement, was discharged and control appointments. Conclusion: The clinical findings of actinomycosis can be confused with a wide range of clinical entities, it is very important to carry out an adequate approach and differential diagnosis; Timely therapeutic measures provide a favorable prognosis and decrease mortality. Actinomycosis; Solitary pulmonary nodule; Lung disease (MeSH LNM). Actinomycosis is a rare, chronic and granulomatous disease caused by a gram-positive and filamentous, anaerobic or microaerophilic bacterium of the family actinomycetaceae of the genus actinomices . One of the most common etiologies in the infection of this pathogen is poor oral hygiene. Other predisposing conditions are diabetes, immunosuppression, alcoholism and mental retardation; however, recent data indicate that about 50% of actinomycosis occurs in patients with no comorbidities . Actinomycosis has different forms of presentation, with cervicofacial being the most common in 50-60%, followed by abdomino-pelvic in 20% and thoracic involvement is rare since it represents approximately 15% of all cases and results Of aspiration of oropharyngeal or gastrointestinal secretions in the respiratory tract [3-6]. Chest actinomycosis is a fairly common disease in developing countries and tends to occur in immunosuppressed patients. However, in the form of lung mass is quite uncommon. Despite the suggestive signs and symptoms of the disease, misdiagnosis such as lung carcinoma, tuberculosis, and lung abscess is common. Thus, the diagnosis of pulmonary actinomycosis requires a high index of suspicion . Given its rarity of appearance and similarity of presentation of this condition with other common respiratory disorders, the following case is presented. A 22 year old male patient from the department of Cortés, Honduras, with a pathological history of epilepsy from the age of 13, managed with phenobarbital, phenytoin and valproic acid. He reports a history of chronic cough, initially nonproductive, which then presented hemoptotic sputum of nocturnal predominance, fever and pleuritic pain, which was admitted for the first time in 2012. 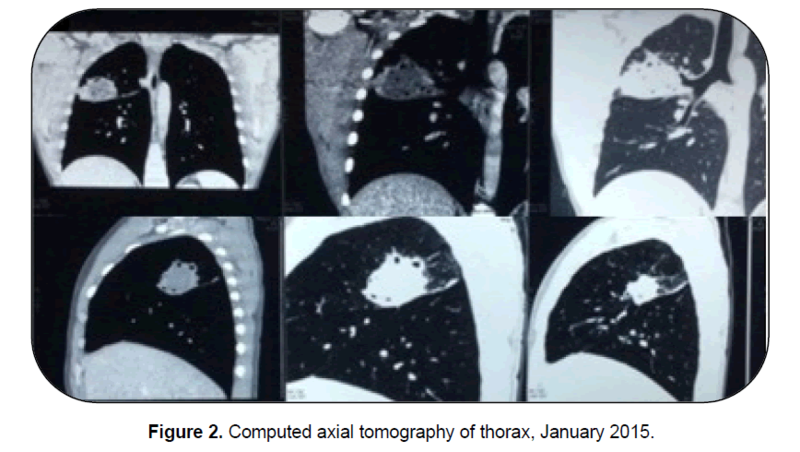 Chest tomography showed heterogeneous lesion in the right lung lobe compatible with the process Pneumonic so he received antibiotic treatment that he did not need and that would have temporarily improved his symptomatology (Figure 1). Figure 1. Computed tomography of the thorax, July 2012. Due to persistent symptoms, the patient went to a private clinic in 2015, where he underwent a chest X-ray demonstrating a right lung nodule and sent to the Cardiopulmonary Institute of Honduras for specialized studies. At the moment of the patient's evaluation hemodynamically stable, febrile and with physical examination evidencing oral cavity with gingivitis and dental caries, hypoventilation and right lung dullness compatible with pleural effusion; Rest of normal physical examination. A chest X-ray was performed, which reported apical right rounded opacity of new appearance suggestive of a neoplastic lesion, which was admitted with a diagnosis of apical mass in the right lung under study. Laboratory tests included leukocytosis of 23,000 mm3 with a predominance of neutrophils 87% and antibiotic treatment was started with imipenem and piperacillin plus tazobactam, which decreased the white blood cell count to normal levels. Bacteriological studies of bronchial secretion did not report pathogenic bacteria and pleural fluid were negative (Ziehl-Neelsen, KOH, ADA, cytopathology). Spirometry was found within reference values; with these findings, a bronchoscopy was performed, evidencing an endobronchial tumor of the posterior segment of the right upper lobe, which was confirmed by chest tomography that reported mass in the lung segment with abscessed characteristics of 5 × 4.6 cm (Figure 2). Figure 2. Computed axial tomography of thorax, January 2015. It was decided to perform right posterolateral thoracotomy where the lesion covers the posterior apical segment, with multiple adhesions, for which partial decortication was performed for extraction and surgical biopsy. The biopsy of the lesion reported: pulmonary tissue with altered architecture, multifocal and intrabronchial fibrotic stroma, and separate granules of filamentous bacteria aggregates compatible with actinomycosis (Figure 3). The treatment with crystalline penicillin 5 million IU IV was modified every 6 hours with PPS showing improvement of the clinical picture and without evidence of complications and was discharged with appointments for outpatient control. (A) Pulmonary tissue with altered architecture; (B) Grocott staining, azurophil granules of filamentous bacteria are observed; (C) Intraalveolar hemorrhage is seen with intrabronchial evidence of filamentous bacteria granules. Source: Department of Pathology, National Cardiopulmonary Institute. Actinomycosis is a chronic infectious disease usually caused by Actinomyces israelii, characterized by suppuration and formation of fistulas by which it drains pus with yellowish white granules. It can affect people of any age, however it presents a bimodal distribution with the first peak being between the ages of 11-20 years and the second, and most important, between the 4th and 5th decade of life [5,8,9]. Hay Few records on the incidence of actinomycosis, but apparently has declined sharply in recent decades . Endobronchial actinomycosis is a rare entity related to the aspiration of a foreign body. The majority of patients are older than 55 years with a predominance of male gender and the presence of predisposing factors mentioned above . Bronchoscopyassociated endobronchial actinomycosis probably results from the secondary colonization of a preexisting broncholite by aspirated actinomycetic organisms. The subsequent inflammatory process results in progressive airway obstruction with postobstructive pneumonia distal to the involved lobe or segment of the lung. The progressive detachment of colonies of actinomyces from their nest aggravates the distal pneumonic consolidation with subsequent formation of abscesses . The diagnosis of thoracic actinomycosis can be clinically established, although this is particularly difficult. Cough, fever, weight loss, and leukocytosis are common without being specific [13,14]. As in the case described, the patient's symptoms did not initially induce the diagnosis. In a study by Bonnefond et al. Carried out in 6 centers in France from 2000 to 2014 of 28 cases of actinomycosis, the most common symptoms observed were fever in 57%, weight loss and anorexia in 43% and 50% of the cases (73%), expectoration (74%), chest pain (68%), dyspnea (47%), hemoptysis (31%), night sweats (32%) and Malaise (42%). This symptomatology is usually confused as neoplasia or tuberculosis, so in most cases the diagnosis is made, as in our patient, with pathological findings when resecting masses with suspicion of tumor. The diagnosis of pulmonary actinomycosis is particularly difficult since it is an obligate anaerobic that must be carefully processed from clinical samples. Because actinomyces are found in 30% to 50% of normal saliva samples, potentially contaminated bronchial washes or sputum studies can not diagnose endobronchial actinomycosis, and because it is a strict anaerobe, routine findings of Crops are generally negative [11,15]. Crop yields are low (<50%) for several reasons: previous antimicrobial treatment, overgrowth of other microorganisms or the use of an inadequate methodology. Actinomyces spp. is a slow growing microorganism, which must be cultured in a medium of selective agar at 37°C in anaerobiosis for at least three weeks. For this reason, the physician must inform the microbiology laboratory of the suspicion of actinomycosis to be incubated for a prolonged period and in the appropriate medium . At an early stage of actinomycosis infection, the disease manifests as a small, poorly defined peripheral pulmonary nodule with or without interlobular septal thickening. With the slow progression of infection, the pulmonary nodule gradually increases in extent to manifest as a consolidation of air space or mass. Although consolidation is usually segmental in distribution at the time of diagnosis, it can replace an entire lobe at a later stage. Characteristics of computed tomography of endobronchial actinomycosis associated with broncholithiasis is a proximal calcified endobronchial nodule (broncholith) associated with distal postobstructive pneumococcal consolidation of the affected lobe or segment . Fine needle aspiration, transbronchial biopsy, and computed tomography or ultrasound guided biopsies lead to accurate diagnosis. The presence of sulfur granules in a biopsy sample is highly suggestive of actinomycosis, but is not diagnostic because they are also seen in nocardiosis, chromomycosis, eumetoma, and botryomycosis . In most studies, the diagnosis of actinomycosis was confirmed by the Histological visualization of colonies of actinomyces surrounded by necrotic mass, suppuration and inflammatory cells. Therefore, invasive investigations are necessary to obtain samples for histopathological and microbiological identification [11,15,16]. The differential diagnosis of actinomycosis includes necrotic lung cancer, tuberculosis, semi-invasive pulmonary aspergillosis and other subacute necrotizing bacterial pneumonia . In the Bonnefond et al. study, in 92% of the cases the most frequently suspected initial diagnoses were malignancies and widespread infections such as tuberculosis. So the diagnosis of actinomycosis was not suspected in the admission of most patients. Diagnosis was obtained from microbiology (50%, n=14) or histopathology (42%, n=12) or both methods (7%, n=2). Positive samples were surgical biopsy (71%), blood culture (18%) and bronchoalveolar lavage . In the present case, the diagnosis was established with positive samples of surgical biopsy of the lesion by means of thoracotomy performed on the patient. While in the past the treatment of actinomycosis was essentially surgical, the incorporation of antibiotics has modified its therapeutics and especially its prognosis. At present, most authors accept combined, antibiotic and especially surgical treatment as a diagnostictherapeutic procedure [11,13]. The cornerstone in therapy for actinomycosis is the administration of high doses of penicillin over an extended period (6 months to 1 year) with a minimum recommended duration of 45 days . In a study by Choi et al. of 28 patients diagnosed with pulmonary actinomycosis evaluated from 1998 to 2003, 54% received only antibiotic therapy, with an average duration of intravenous treatment of 3 days (range=1-18 days) and treatment (Range=76-412 days) . In the Bonnefond et al. study , susceptibility to antibiotics was evaluated in 13 patients, in which almost all strains were susceptible to amoxicillin, rifampicin, clindamycin and clotrimazole. All patients were treated with antibiotics, mainly beta-lactams and especially amoxicillin, which was used in twothirds of patients. The mean duration of treatment was 150 days (range=90-180) in cardiothoracic forms [1,6,17]. In a study by Choi et al. of 28 patients diagnosed with pulmonary actinomycosis evaluated from 1998 to 2003, 54% received only antibiotic therapy, with an average duration of intravenous treatment of 3 days (range=1-18 days) and treatment (Range=76-412 days) . In the Bonnefond et al. study, susceptibility to antibiotics was evaluated in 13 patients, in which almost all strains were susceptible to amoxicillin, rifampicin, clindamycin And clotrimazole. All patients were treated with antibiotics, mainly beta-lactams and especially amoxicillin, which was used in twothirds of patients. The mean duration of treatment was 150 days (Range=90-180) in cardiothoracic forms [1,6,17]. Bonnefond S, Catroux M, Melenotte C, et al. (2016). Clinical features of actinomycosis: A retrospective, multicenter study of 28 cases of miscellaneous presentations. Medicine. 95: e3923. Kassab K, Karnib M, Bou-Khalil PK, et al. (2016). Pulmonary actinomycosis presenting as post-obstructive pneumonia. Int J Infect Dis. 48: 39-31. Chawla R, Madan A, Chawla A, et al. (2014). Hemoptysis secondary to actinomycosis: A rare presentation. Lung India. 31: 168-71. Faba R, Trujillo S, Peña P, et al. (2014). Actinomicosis torácica por Actinomyces odontolyticus. Rev Chil Enferm Respir. 30: 1-5. Gómez Mateo MdC, Urbano Salcedo A, Toro de Méndes M, et al. (2011). Actinomicosis pulmonar. Diagnóstico por punción-aspiración con aguja fina. Invest Clin. 21: 358-364. Choi J, Koh WJ, Kim TS, et al. (2005). Optimal duration of IV and oral antibiotics in the treatment of thoracic actinomycosis. Chest J. 128: 2211-2217. Gupta P, Dogra V, Goel N, et al. (2015). An unusual cause of a pulmonary mass: Actinomycosis. Indian J Chest Dis Allied Sci. 57: 177-179. Farrokh D, Rezaitalab F, Bakhshoudeh B. (2014). Pulmonary actinomycosis with endobronchial involvement: A case report and literature review. Tanaffos. 13: 52-56. Vasquez J, Ahumada R, Wagner G, et al. (2010). Actinomicosis pulmonar: Infección pulmonar inusual. Rev Am Med Respir. 10: 69-72. Brizuela M, Latella A, Sancho Cano J, et al. (2015). Actinomicosis torácica: Presentación de un caso. Arch Argent Pediatr. 113: 345-348. Pereira N, Cuevas P, Valencia C, et al. (2012). Thoracic actinomycosis in the differential diagnosis of neoplasm: A propos of a case. Rev Chil Infectol. 29: 455-458. Thomas M, Raza T, Al Langawi M. (2015). A 37 year old man with non-resolving pneumonia and endobronchial lesion. Chest. 148: 52-55. Kim TS, Han J, Koh WJ, et al. (2006). Thoracic actinomycosis: CT features with histopathologic correlation. Am J Roentgenol. 186: 225-231. Villalta J, Henriquez C, Valls A, Alamo R, et al. (1987). Actinomicosis torácica: A proposito de un caso. Arch Bronconeumol. 23: 133-135. Ramírez F, Barrera EC, Méndez RY. (2010). Actinomicosis pulmonar. Una enfermedad olvidada. Acta Med Colomb. 35: 132-134. Valour F, Sénéchal A, Dupieux C, et al. (2014). Actinomycosis: Etiology, clinical features, diagnosis, treatment and management. Infect Drug Resist. 7: 183-197. Park JY, Lee T, Lee H, et al. (2014). Multivariate analysis of prognostic factors in patients with pulmonary actinomycosis. BMC Infect Dis. 14: 1471-1233.